Some people just don’t get it. 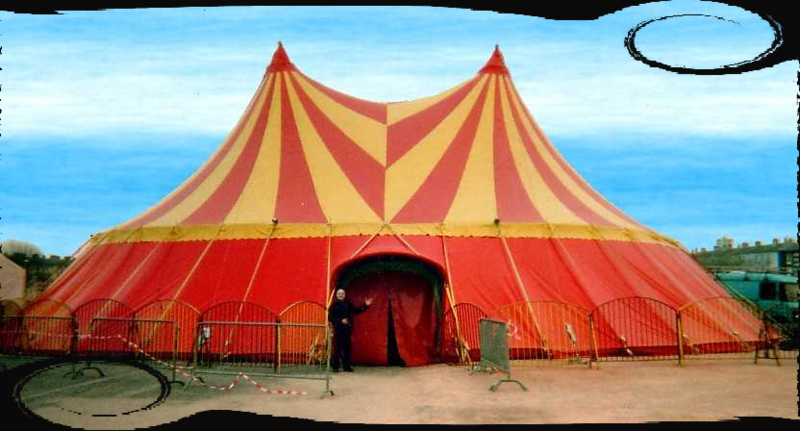 Apprising Ministries has been making you aware of the now upgraded Emerging Church 2.0 with its newer, more clearly delineated, postmodern Progressive Christian theology—a Liberalism 2.0—that this sinfully ecumenical neo-liberal cult of the Emergent Church often refers to as “big tent” Emergence Christianity. Now this cult is completely out of the closet regarding the soteriology of their new version of liberal theology: Pagan universalism. Even as we speak these rebels against the final authority of God’s Word are furiously building an updated version of the mush god of mysticism with a man-shaped hole in his/her/its heart. This is all a huge part of what Living Spiritual Teacher and EC guru Brian McLaren, one of the unholy Emergent Church trinity of apostates along with universalist Emerging Church pastor Doug Pagitt, and his friend Tony Jones—the progressive “theologian in residence” at Pagitt’s Emergent Solomon’s Porch—began laying out more systematically in his latest book A New Kind of Christianity (ANKoC). The wise person is going to ask: Just what does this “possible future Cox envisions,” and Brian McLaren is “motivated” to “help make actual,” look like? Well, Lord willing, I’ll be showing you more and more aspects concerning this new form of postmodern liberalism in days to come; here we’re concerned with the mystic mush god they’ve ordered up from the ol’ Build-A-God Shop. Let me remind you of something I previously pointed out in Seducing Spirits Sounding The Same, while putting this into its proper perspective; when a pantheist proponent of New Spirituality—once known as the New Age Movement—like Deepak Chopra can sign on to your “big tent” supposed “resurrection of a new global Christianity,” then it’s safe to say that you’ve officially departed from anything even remotely resembling the historic, orthodox, Christian faith. We’re told that the keynote speakers will be little known pastrix Carol Merritt, along with some names quite familiar to you here at AM, with the aformentioned EC guru Brian McLaren; then there’s also uber-liberal Living Spiritual Teacher and “Progessive Christian” scholar Marcus Borg, Living Spiritual Teacher and apostate Roman Catholic mystic Richard Rohr, as well as Shane Hipps—co-teaching pastor along with EC rock star icon Rob Bell at the infamous social club Mars Hill Bible Church. 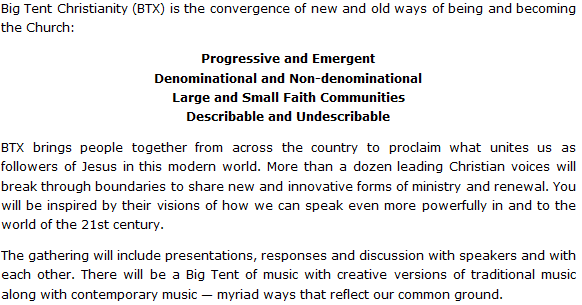 Also among those who’ll be involved with this bad dream next month will be Dr. Philip Clayton of the Claremont School of Theology; Clayton’s side-kick from the Transforming Theology network Tripp Fuller, universalist Spencer Burke and “queer inclusive” ELCA “pastor” Nadia Bolz-Weber. 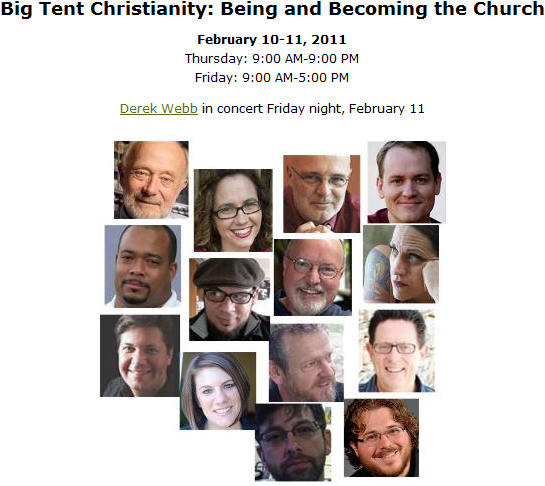 Another time I should have more on this; but in closing this for now, let’s note we’re told that this particular collection of performers under our big top will allegedly “proclaim what unites us as followers of Jesus in this modern world.” Supposedly more than “a dozen leading Christian voices will break through boundaries to share new and innovative forms of ministry and renewal.” Really; leading Christian voices? Leaving aside the others I just mentioned, some of whom don’t really show enough evidence to have them be convicted as being Christian, but Marcus Borg? Only in the postmodern Wonderland of Humpty Dumpty language, where words don’t retain their actual meanings, could Borg even remotely be considered a Christian—let alone a leading Christian voice. This is because Borg sets up a false dichotomy between what he calls “pre-Easter” and “post-Easter” Jesus where pre is said to be a, “Corporeal, human being of flesh and blood” and, “Finite and mortal,” while post is said to be, “Spiritual, non-material reality,” as well as, “Infinite, eternal.” Since it’s beyond the scope of this particular piece to present an apologetic against such lies; suffice to say that anyone reading the Gospels without the “lens” of destructive higher criticism hatched by modern i.e. liberal scholarship will see that Jesus is presented as all of these things prior to His crucifixion. There is something about people who are in touch with the sacred that can be felt by those around them; it evokes awe and amazement and impresses people with the feeling of another world. Such was true of Jesus… The cumulative impression created by the stories in Matthew, Mark, and Luke is that Jesus stands in the Jewish tradition of spirit persons. Seminary also introduced me to the historical study of Jesus and Christian origins. I learned from my professors and the readings they assigned that Jesus almost certainly was not born of a virgin, did not think of himself as the Son of God, and did not see his purpose as dying for the sins of the world… I also found the claim that Jesus and Christianity were the only way of salvation to be troublesome. To be Christian means to find the decisive revelation of God in Jesus. To be Muslim means to find the decisive revelation of God in the Koran. A nice sentiment from Marcus Borg, but not a Christian view; and taken along with his denial of the Deity of Jesus Christ, I find myself asking: Can you actually be a Christian when you don’t even believe what Christians believe? Jesus Himself said to Jewish religious leaders—men every bit as pious as Marcus Borg may be — “I said therefore to you that you will die in the sins of you; for if you believe not that I Am [the eternal God], you will die in the sins of you” (John 8:24, literal Greek). The well-trained cultist will carefully avoid definition of terms concerning cardinal doctrines such as the Trinity, the deity of Christ, the Atonement, the bodily resurrection of our Lord, the process of salvation by grace and justification by faith. If pressed in these areas, he will redefine the terms to fit the semantic framework of orthodoxy unless he is forced to define his terms explicitly. The Good News of Christ Jesus is repentance and forgiveness of sins in His Name; in other words, the regenerated believer will not die in his sins. But Marcus Borg, by his own admission, does not believe Jesus is God in human flesh i.e. very God of very God; so by definition then, 1) this is a different Jesus (see—2 Corinthians11:4), and 2) Dr. Borg is in danger of dying in his sins. Therefore, if we love Marcus Borg, we won’t let him deceive himself into thinking he’s a Christian; no instead, we’ll pray for his repentance and preach the Gospel to him. Marcus Borg, The God We Never Knew: Beyond Dogmatic Religion To A More Authenthic Contemporary Faith [San Francisco: HarperOne, 1997], 25, emphasis mine. Walter Martin, The Kingdom of the Cults, Ravi Zacharias, Gen. Ed. [Minneapolis: Bethany House, 2005], 33.